Most Europeans and Americans are taught at school that daylight saving time (DST) reduces energy consumption. This common wisdom has been repeated by such august authors as Thaler and Sunstein, who praise DST in their book Nudge (Thaler and Sunstein 2008). Of course, daylight saving time was originally adopted by several countries during WWI to reduce energy use, but academic research on the extent of energy savings related to DST in a modern economy is surprisingly thin. We have gone through journal articles, unpublished working papers, energy company reports, government papers, and PhD dissertations and found 44 usable studies carried out since the pioneering Ebersole (1974) report. Unfortunately, a casual look at the literature does not help us. Estimates are all over the place, and are far from converging to a consensus value. Note: Studies measure the effect of daylight saving time on energy use, so a negative estimate implies energy savings. Two existing surveys of the literature – Reincke and van den Broek (1999) and Aries and Newsham (2008) – also show that different researchers obtain substantially different results. One can find evidence in support of energy savings resulting from DST, just as one can find evidence of increased energy demand associated with DST. For example, the most-cited empirical study, Kotchen and Grant (2011), concludes that, contrary to the policy’s objective, DST increases energy use. (The result might be the reason why the study receives so many citations, although it was also published in a prestigious journal, The Review of Economics and Statistics.) Aries and Newsham (2008: 1864) conclude that “the existing knowledge about how DST affects energy use is limited, incomplete, or contradictory”. 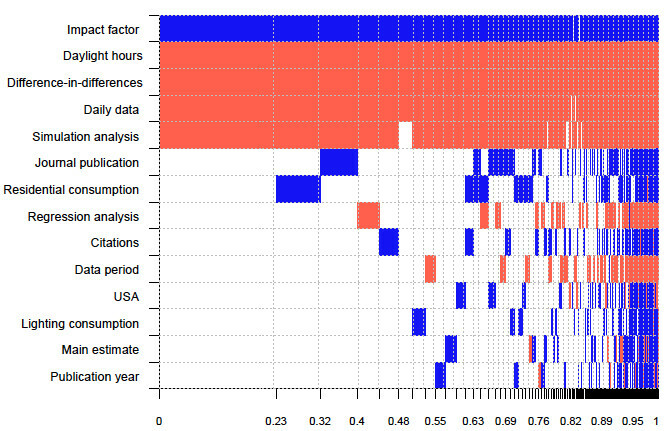 Indeed, one can find contradictory results even within many individual studies, as Figure 2 demonstrates. In a forthcoming paper, we conduct a quantitative synthesis of the literature: a meta-analysis (Irsova et al. 2018).1 Our intention is to trace the differences in results back to differences in data, methods, and potentially also general study quality. 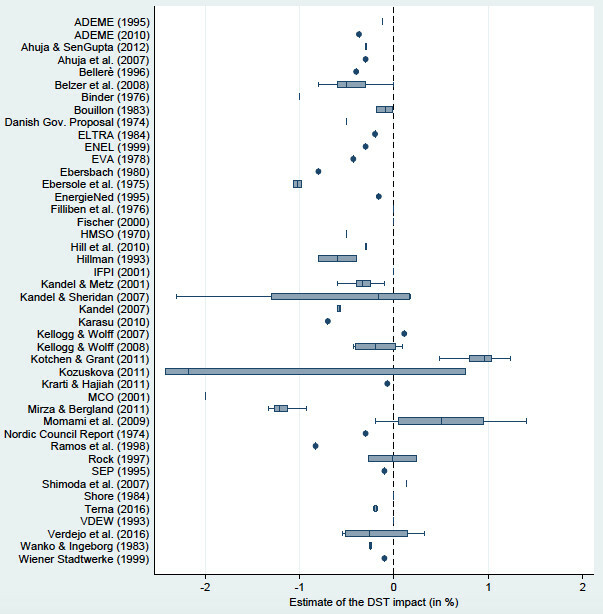 From the 44 studies on the effect of DST on energy consumption, we collect 162 usable estimates. First, we test for publication bias, which typically exagerrates results in empirical economics by a factor of 2 (Ioannidis et al. 2017). We find no publication bias whatsoever, which is a remarkable finding in itself. 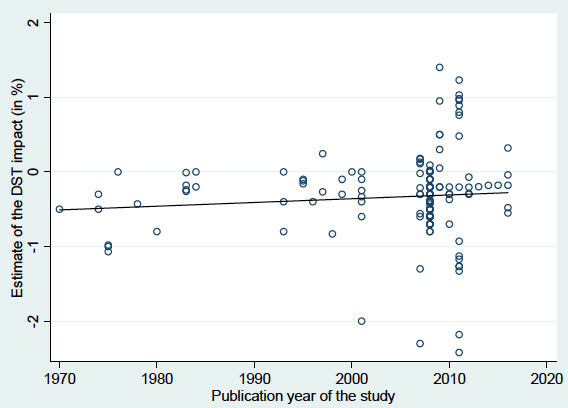 Yes, our dataset includes many unpublished studies, but in economics publication bias is typically found even in working papers, as many authors routinely discriminate against unintuitive and statistically insignificant results. The lack of publication bias means that we can proceed to the main part of our analysis – an examination of why the reported estimates vary so much. To this end, we regress the estimates of the DST effect on factors associated with the context in which the estimates were obtained. For example, we include the number of maximum daylight hours in the region to which the estimate corresponds. Among other factors, we control for the frequency of data on energy use (hourly or daily), estimation technique (simulation, difference-in-differences, simple regression), definition of energy consumption (commercial, residential, lighting only), and aspects that may be related to quality (journal publication, impact factor of the outlet, number of citations). Note: Factors are sorted from top to bottom by importance. Their combinations (models) are shown in columns sorted from left to right by usefulness. Relative usefulness is represented by column width. Blue color means that the factor contributes to finding less savings from DST. The results show that studies published in more prestigious outlets typically report less energy savings from daylight saving time, and that countries with more summer daylight hours (that is, higher latitude) enjoy more energy savings. The frequency of data and estimation methodology are important as well. Next, for each country in our sample we compute estimates of the DST effect conditional on best practice in the literature. Essentially, using the meta-analysis results we re-compute estimates as if they were all produced by studies using the difference-in-differences approach, hourly data, and were published in outlets with the maximum impact factor. The best-practice estimates are shown in Table 1. 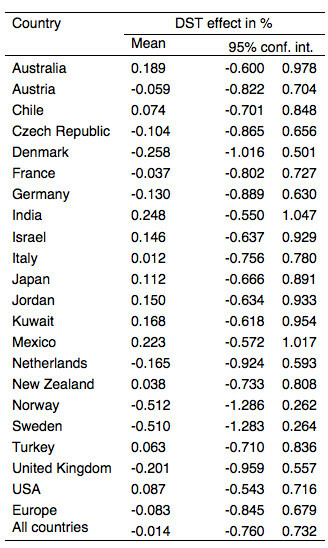 Negative estimates mean that for these countries DST reduces energy consumption. For some countries with lower latitude, even in Europe, DST seems to increase the use of energy. But all estimates are statistically insignificant and very small. The mean for the entire dataset is almost precisely zero. Norway is the country with the highest benefits from DST, but even there the effect is only 0.5% during the days when DST applies, and therefore about 0.3% of annual consumption. Daylight saving time affects 1.5 billion people around the world twice a year – sometimes fatally, as shown by studies documenting traffic accidents due to time shifts (Smith 2016). With the finding that daylight saving saves no energy to speak of, the original and still commonly used rationale for the policy falls. Perhaps DST really isn’t such a good nudge; dozens of countries have abandoned it in recent decades. Or perhaps the convenience benefits of longer evening daylight hours prevail over the inconvenience of sleep deprivation and even loss of lives resulting from traffic accidents (and possibly from an increased incidence of heart attacks and depression). Or perhaps a year-round DST would retain most of the benefits while removing the many problems associated with time shifts. We simply don’t know. We still await a study that would systematically compare all the different benefits and costs of daylight saving time. Reincke, K-J and F van den Broek (1999), "Executive Summary" in Summer Time: Thorough examination of the implications of summer-time arrangements in the Member States of the European Union, study conducted by Research voor Beleid International for the European Commission. The full paper, together with data and codes, is freely available at http://meta-analysis.cz/dst.